Dunbar and Boardman: Who built the Medellín Escalator? There are many amazing examples of vertical transportation around the world but few can claim to be as transformative as the Medellín escalator in Columbia’s second largest city. The large outdoor escalator is located in Medellin's tough Comuna 13 district and was officially opened in December 2011 by the mayor of Medellín, Alonso Salazar Jaramillo. The escalator was built at a cost $6.7 million and funded by the city. It is divided into 6 sections and is 384 metres (1260 feet) long. There is one escalator for Comuna 13’s twelve thousand residents to travel up the hillside and another to descend. A journey that used to take 36 minutes on foot now takes just six minutes. 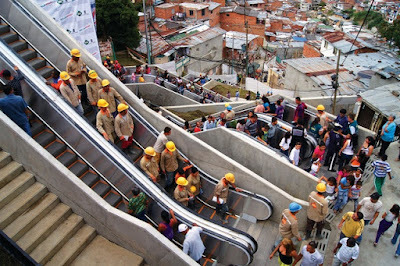 Who Designed the Medellín Escalator? If the city of Medellín sounds familiar it is probably because of the city’s most infamous inhabitant, a man known as Pablo Escobar. Escobar was a drug lord and during his regime many of the city’s inhabitants fled to the hillside areas including Comuna 13 even though the hillside areas lacked many amenities. Comuna 13 is essentially a shantytown similar to the favelas in Brazil. Comuna 13 was already one of the city’s poorest districts and drug gang violence made matters worse. "This should be a symbol of city transformation and peace for Comuna 13." Construction of the escalator was not a straightforward process. The city had to conquer territory from the gangs while building the escalator. What Impact has the Medellín Escalator had? The completion of the Medellín escalator was a tremendous achievement. It was the first such outdoor public escalator designed for use by residents of a poor area. The quality of life for residents was improved. Gangs were displaced and overall the environment was enhanced. It is now easier for Comuna 13 residents to travel to the city for work; they are better connected with the city’s commercial centre. Perhaps surprisingly the escalator has become an international tourist attraction. Visitors come to ride on the escalator that has become a symbol of inclusion, civic pride and dignity. The escalator has made Medellín a shining example of progressive urban planning ideas. In 2012 Medellín was named The World's Most Innovative City in a competition organised by the non-profit Urban Land Institute.